1. Press the WIN (Super) and ALT keys together. 2. While keeping them pressed, right-click the panel. 3. You will then get a popup menu saying “New Panel”, or “Add to Panel”. 4. Click on the second option and select your program. 1. Follow steps 1 & 2 from above. 2. You will get a popup menu saying “Move” and “Remove from Panel”. 3. Click on your choice. 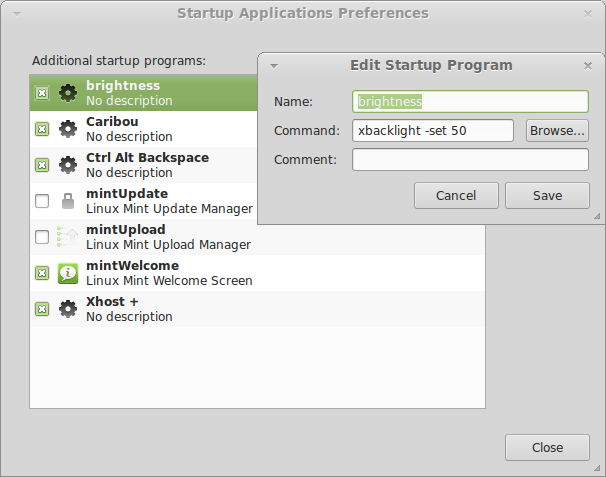 How to make brightness changes permanent in your Linux Desktop? Quite recently, I’ve faced this nagging little issue on all the distros I tried. These included Ubuntu 12.04 LTS, Linux Mint 11.1 and Fedora 18. Whenever I changed my computer’s brightness setting either through the gnome-settings applet or by using hotkeys, the changes were only temporary. On next reboot, they would vanish!! Now what is the easiest way to make your chosen setting permanent? After much googling and head-scratching, I finally arrived at the answer. Although this command might change your brightness, again the effects are only temporary and will be lost on your next reboot. If you attempt to place this in /etc/rc.local, it may not always work due to permission issues. Instead of ending up chmod-ing the permissions to the brightness file and cause any other issues in turn, the recommended approach is to use xbacklight, the tool fit for this purpose. Thats all. This effectively sets brightness to 50% by default upon your each login. Enjoy!! Posted on February 18, 2013 March 4, 2013 Categories desktop, linux, tips-and-tricksTags brightness, linux, linux desktop, tips and tricks, xbacklight2 Comments on How to make brightness changes permanent in your Linux Desktop?